Nathan, Tim, and I brewed this batch of dark rye beer back before Thanksgiving 2009. I should have posted a tasting sooner, but we were originally going to post it over on BrewLocal. We didn't end up brewing it quite as intended so we eventually decided to scrap the post over there, and I didn't want it to fall through the cracks. As a result the beer has already lost the hop aroma it had when it was young, but it is still a tasty and unique session beer. Appearance – Dark chocolate brown with amber highlights when held to the light. Decent light tan head with some coarse bubbles. Good retention. Smell – Light toasted/bread malt with a bare suggestion of coffee. The aroma has lost the fresh hoppiness it had a few months back, which helps to showcase the malt even more. Still clean, not showing any signs of oxidation yet. Taste – Well balanced, malty but still with a clean hop tickle on the back of the tongue. 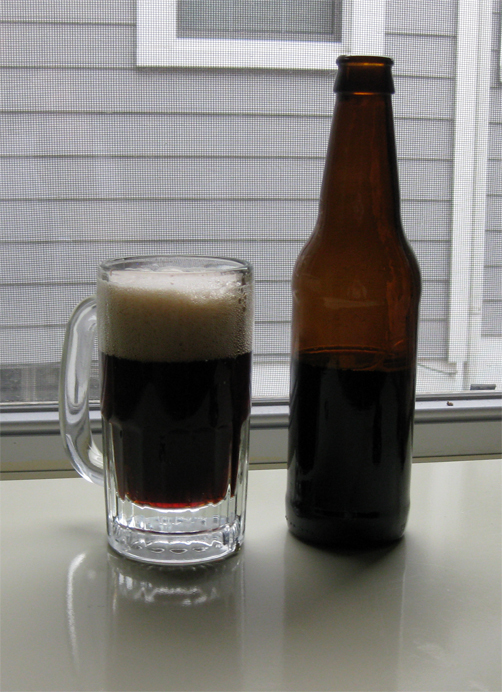 The malt character comes through from the aroma, somewhere between an English Brown and a Schwarzbier in my estimation. It's hard to tell what the toasted rye flakes contribute, but they probably help give a depth to the toasty character. Drinkability & Notes – Even with a few extra months on it this is a solid beer. It would have been interesting to compare the same recipe with a lager yeast as we originally intended, but that will have to wait for another brewday.